This one time, I had proper refried beans in a burrito in California. With a handmade tortilla. I think I cried from sheer joy, I don’t really remember. It’s possible. Likely, in fact. But it sure was a spiritual experience. I’m happy with the canned refried beans, really I am. Especially when doctored up and made delectable. I’m probably still searching for that ultimate bean experience though. It’s imprinted into my soul. I’m inclined to cook the pinto beans in stock sometimes also. To me it just adds that extra depth of flavour I’m searching for, and in my mind adds an extra layer of veggie vitamin goodness. You really can put what you like in at the end – beans are such a subjective issue! 1. Put the soaked and drained beans in a pot and cover with water to about an inch above the beans. Add the bay leaf and bring to a boil. 2. Put the lid on and simmer 1 hour. 3. Pour the beans into a bowl and heat the olive oil in the pot. Saute the onion and garlic a few minutes until soft. 4. Add cumin and chilli and cook 1 minute. 5. Ladle the beans and about 1/2-3/4 cup of the cooking water into the pot. Mash with a potato masher until soft. 6. Stir with a wooden spoon quite firmly until beans break down and become a thick paste. Add the salsa, sauce, salt and sugar. 7. Check for seasoning and ensure the beans are the right consistency for you. Add some cooking water if they are too stiff. Oh my goodness, LA Mexican food is so good it should be illegal! i made homemade tortillas the other night (with a great recipe by the homesick texan), and they weren't bad! maybe i'm very late to the party, but i had no idea how easy it was. very impressed by refried beans!! This sounds yummy! I like the canned beans too, but sometimes I feel guilty using them! What is that? It seems silly to make them when they're easily available to buy, but when you think about it, the opposite is true! Ha, I never feel guilty using canned beans! They're awesome. 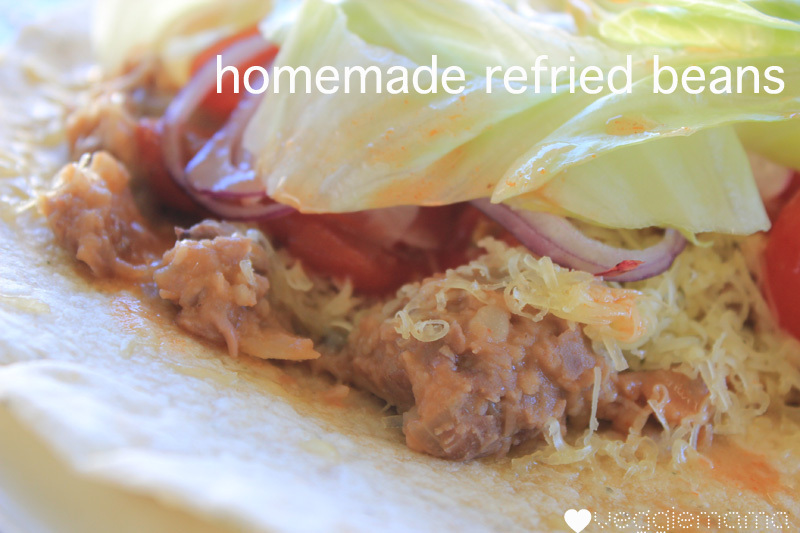 yum yum yum home made refrieds are the shiz and so EASY! I use red kidney beans for the extra sense of beany carnage and like to fry up a finely diced capsicum when I do the onions AND a teensy bit of cinnamon! Get on it VM, its awesome! Ah yes the cinnamon! I do use that from time to time! growing up we always had a pot of beans. seriously every day, i guess it comes with the whole being Mexican thing. 🙂 my favorite way to eat them is on fresh made tortillas with queso fresco, avocado, and salsa. still one of my favorite comfort foods.